Madra is a certified Reiki Master, works with the energies of the Divine Feminine. Having had several near death experiences during childhood, she understands true Divine intervention. Divine Guidance has helped her realize her path and purpose at this time. She has always been considered a pillar and counselor for others as she has been consistently blessed with a strong connection to spirit and the Divine universal energies. She is the integrated trinity of the Divine Mother, the Earth Mother and the Physical/Human Mother. She has been guided to work with balancing and harmonizing energies for many years serving as an anchor for the Divine feminine energies affecting so many at this time as well as Gaia herself. Accompanied by Divine energies, she works with crystals and a variety of tools, including sound vibration tools, to assist others in bringing harmony and balance to their physical and spiritual being. Since her reconnection to the crystal skulls, she has experienced a complete life makeover that she contributes to the crystal skull consciousness. She is now living her truth and sharing her life experiences knowing that 'it's in the sharing that we will realize our true identities and abilities'. This 'sharing' empowers us and helps us to 'remember'. As caretaker of crystal skulls, she teaches on their purpose and the messages they deliver for the 'golden age of awareness' that we are all transitioning into. Having worked with some of the ancient crystal skulls along with her own crystal skulls, has definitely blessed her with the knowledge of her connection to this ancient wisdom and the purpose of the crystal skulls at this time. With her intuition and the help of crystal skulls serving as a catalyst for change she channels the crystal skull consciousness and serves as facilitator of energy transference and attunements that are life altering. Her work is focused upon aiding in personal growth and is effective in empowering others in realizing their own abilities to heal and balance themselves. She is able to intuitively confirm and/or validate information that assists in life's journeys. She believes that we each have everything we need to journey in this life; however, some of us need assistance remembering who we are and why we are here. She believes that crystals, sound, and color serve as tremendous tools in raising our vibration which assists in facilitating spiritual evolution. Currently, she serves in various capacities as facilitator for those seeking guidance during transitional and transformational experiences at The Sanctuary for Mind, Body and Spirit in Bartlett, Tennessee (in the Memphis, Tennessee area). She enjoys facilitating workshops, meditations and offers guidance for those seeking nurturing energy. She is able to help others connect with crystal tools to assist them on their journey and 'coaches' them in getting their creative and productive energies flowing which is vital to living a fulfilled life and being ‘on purpose’. Madra has been working closely with Sherry Whitfield and the Ancient Crystal skull Synergy, doing Shamanic sessions and will be featured in the upcoming Avalon Video production about Crystal Skulls. This is a life altering four-hour workshop promising enlightenment on the crystal skulls. Why they are here? What are their origins? What are the misconceptions associated with them and some of the mysteries surrounding them? I will share my personal story and experiences along with the empowerment that goes with being a crystal skull caretaker. Metamorphosis begins immediately as they help you build and hold a higher vibration. They open your perceptions and help to heal your life. There will be a lot of hands-on interaction with the crystal skulls as we experiment with them allowing everyone to observe the energy of the crystal skulls and the transformative vibrations associated with them. 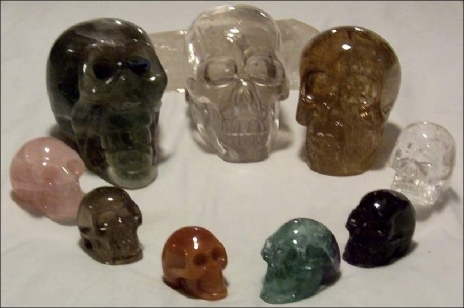 Everyone will get to experience meditation with a crystal skull. There will be a healing circle of crystal skulls to assist delivery and comprehension of the messages being given. By introducing others to the crystal skulls and educating them on what powerful tools they are in helping us to overcome fears that rule or control our life, we facilitate empowerment for spiritual evolution. They aid us in holding our vibration to a level of trusting and knowing that process and that we are unified in what we are here at this place and time for. We are required at this time to stand in our truth and go forward with the knowledge that we have everything necessary to accomplish our mission. Experiencing the crystal skulls will have an impact that leaves one enlightened, empowered and forever transformed.